This article was originally published in the February 25, 1918 issue of THE EDITOR magazine. 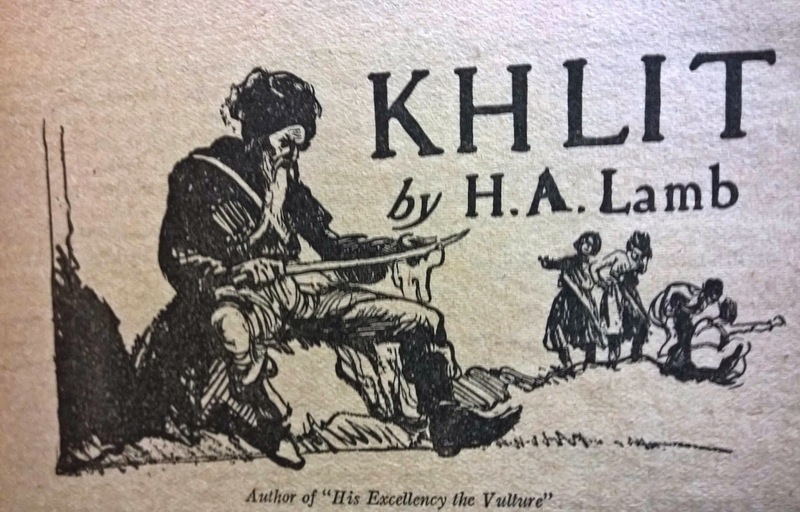 Harold A. Lamb talks about the influence of editors on his first story of Khlit the Cossack and how he came to write it. The editor he refers to in the story is likely Arthur S. Hoffman. "Khlit" (Adventure) is a patch of a story—it came near being a misfit patch. The generating idea was the need of a check ! Some attractive notes on the early Cossacks suggested that a tale might be wound around the arrival of a young Cossack at the war encampment of his elders. There must, of course, be something to mark the arrival of the new warrior at the Zaporogian Siech—lsland camp of the Cossacks, and it occurred to me that he might be made to swim the Dneiper, as all arrivals strove to make an impression by some display of wealth or daring. Further complication was necessary to make a story out of this, and it was natural that one of the older Cossacks should be awaiting the appearance of the novitiate—his god-son. The complication began to focus when Khlit, the elder Cossack, wagered the bulk of his wealth with a gambler that his god-son would arrive at the Siech as no Cossack lad had done before. A wager is always of human interest. Readers like to know the result. Here we have Khlit risking his moderate riches in his pride in his god-son, and on the young Cossack's promise that he would arrive on a certain day. Gambler opposed to warrior—and old alignment, but one full of interest. Here is where the patch story of Khlit came near being a misfit patch. Because if the wager had been won for Khlit by some unexplained bit of daring on the part of his god-son, the tale would have missed fire. In studying over the character of Khlit it seemed to me that he had something in common with the viewpoint of a certain celebrity who favored keeping his powder dry. Khlit's pride trusted in the arrival of his god-son on the promised day. But the wager was that the arrival was to be without precedent, and all the Siech was watching. So when the tale was nearly complete, it occurred to me that Khlit really ought to conceal the oars of the one ferry to the Island camp—still trusting in the promised arrival of his god-son. Consequently the young Cossack swam the Dneiper. The tale was helped by the fact that a reader must guess at what goes on in Khlit's mind until the last paragraph. Readers like to guess—until the last sentence. But it was the advice of the editors of Adventure that showed how to clear up the obscurity that threatened to cloud my vision. My first story was printed only two years ago. It was the joint product of unlimited hopefulness on my part and endless patience of an editor. A note had summoned me to the editor, and I waited upon him to hear with great anxiety the defects of two stories I had submitted. The editor was smoking a very bad cigar, and relapsed into silence et the end of his verdict. I suggested that it would improve one tale to interchange the characters who were hero and villain of the plot. Eventually the strange evolution came to pass. Editors give a new writer his first impetus into the world of fiction— and they stick by him. They have their pet features, which in most cases count in favor of the stories they pass on. Also the editor can tell a new writer what to do—while the fiction schools, text books, etc., can do little more than warn him from things he should not do. But the newcomer must show ability. And he has to face setbacks. At one time I called in person to inquire the whereabouts of a manuscript t had sent to a strange office. The story had been returned previously with suggestions for change, and a hint at acceptance. The assistant editor heard my query with a tolerant smile. "Haven't you got it back yet? " he asked. It seemed the manuscript had been lost at the office and it was necessary to rewrite it. The new version was an improvement upon the lost story. Subsequently I sold a good many thousand words to these people. From them I learned an effective system of filing newspaper clippings and of outside reading which did not include other fiction. All along editors have been my best friends, and such success as came to me I owe to them.